Easter is early this year — Sunday, March 31st. So we’re already hankering after baskets of chocolate candies. Especially the kind with luscious buttercream centers. We won’t be visiting the candy aisle, though. Instead, we’ll be whipping them up at home. And they’re easy! If you can make buttercream cake icing, you’ll find it a snap to mix the filling for these candies. And your friendly microwave can melt the chocolate for a rich coating in a just few minutes. Best of all? No weird chemical preservatives. 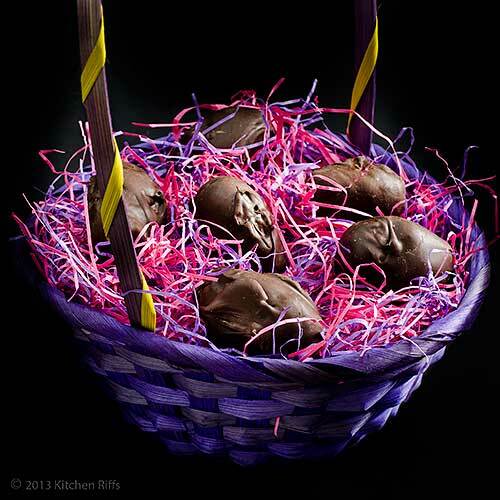 Your own homemade Buttercream Candy Easter Eggs might not have the year-long shelf life of the commercial ones. But you’ll find their fresh taste to be more intense — and just all around better. Besides, who keeps these things around the house for months, anyway? They’ll be gone within a week, tops. Or maybe the same day you make them (I’m just sayin’). This is a simple recipe, but it does have a few distinct steps. First, you make the buttercream filling (with flavoring of your choice to provide extra zip). Then you let the filling chill until it’s firm enough to shape. Next, you form the buttercream filling into the desired shape: little eggs for Easter, or round balls or discs if you prefer (just like boxed chocolates). Then you allow the candy to chill again, preferably in the freezer (so it will hold its shape when you dip it in chocolate coating). Next, you melt chocolate and dip the candy. Finally, you let the buttercream candy chill again so that it doesn’t fall apart when you eat it. You can make these candies in almost any flavor you can imagine. We’re using vanilla extract today, but the Notes discuss a number of other flavor variations. Mrs. Kitchen Riffs adapted this recipe from the Land o’ Lakes website. Active prep time is about 10 minutes for mixing the buttercream filling, and another 20 minutes or so for forming and dipping the candies. Plus you’ll need a minimum of two hours (unattended) for chilling and freezing. So allow at least 2½ hours from start to finish. This recipe makes 2 to 3 dozen candies. Buttercream candies will keep for up to two weeks if refrigerated in an airtight container. You do need to refrigerate these: They contain no preservatives, and they’ll soften when out of the refrigerator too long. Place butter and cream cheese in the bowl of a stand mixer (or use a large bowl and a hand mixer). Beat at medium speed, scraping sides of bowl several times, until smooth and creamy. Add vanilla. Continue beating until well mixed. Turn off mixer and add one cup of powdered sugar, mixing by hand with a spatula or wooden spoon just enough to incorporate into butter mixture. Then turn mixer back on and beat until well mixed. Repeat until all powdered sugar is added. Refrigerate buttercream mixture for at least 30 minutes (an hour is better) so that it firms up. Remove buttercream mixture from refrigerator. Form tablespoons of mixture into egg-shaped ovals and place them in a freezable plastic container (separate layers of candies with sheets of wax or parchment paper). Freeze for at least one hour, or until solid enough to pick up with a toothpick. Melt chocolate in the microwave in a 1-quart microwave-safe bowl for about 2 to 3 minutes (checking at 1-minute intervals), until fully melted. Add vegetable oil to melted chocolate and mix in well. The mixture should be thin enough for dipping candies (if necessary, add more vegetable oil to thin further). Allow melted chocolate to cool until it is just lukewarm. Tear off a sheet of wax or parchment paper about two feet long, and place on workspace. Remove buttercream candies from freezer. Using toothpicks, dip buttercream candies into chocolate mixture. Let excess chocolate drip off (or scrape lightly with a spoon). Place chocolate-covered buttercreams onto wax/parchment paper to set. Once the chocolate coating has become firm enough to handle, place candies in an airtight container and refrigerate until ready to eat (allow at least 30 minutes for the candies to chill completely). It’s easy to vary the flavor of these. Instead of vanilla, you can substitute another extract (such as raspberry, orange, maple, rum, or almond). Or whatever flavor you choose. When using flavoring extract, start with about 2 teaspoons, then add more if desired. Mrs K R typically uses 3 or 4 teaspoons, but adjust to your own taste. For chocolate buttercreams: In Step 1, add ~2 tablespoons unsweetened cocoa. 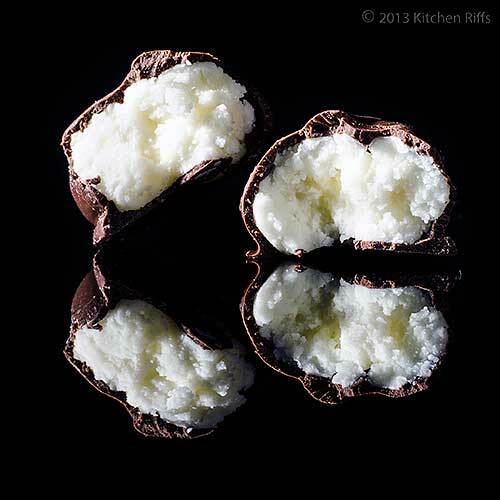 For coconut buttercreams: In Step 1, add 2½ to 3 cups sweetened, flaked coconut. For maraschino cherry buttercreams: In Step 1, add ¾ cup chopped, well-drained maraschino cherries (be warned that these tend to turn out a bit soft; they’re good, though). The quantity of powdered sugar in this recipe is flexible. Mrs K R has seen versions that call for as little as 3 cups, or as much as 7 cups. She finds 4½ cups to be about right — but again, adjust to your own taste. Buttercream mixture is very difficult to work with when it’s soft. So refrigerating the mixture before you form it into candies (Step 3) is a necessity. Buttercream also melts easily. So freezing the candies before you dip them in the melted chocolate (Step 4) is also highly recommended. You should use high quality (pure) vanilla extract in this recipe. Its flavor is so much better than the imitation kind. Pure vanilla extract is made by soaking vanilla beans in a mixture of water and alcohol for several months. BTW, the FDA requires that pure vanilla extract contain at least 35% alcohol. If the label doesn’t say “pure,” that means it’s made from synthetic vanilla. The artificial kind is usually derived from the sapwood of several species of conifers — or from coal extracts! How appetizing (not). The flavor of some imitation vanillas can be nasty. You don’t have to spend a fortune on pure vanilla extract, but getting decent quality does mean spending a bit more for something that’s not loaded with sugar or imitation flavoring. Do yourself a favor and get the real stuff. Same deal with the other flavored extracts — it pays to use decent quality. If your supermarket doesn’t stock them, you can find high-quality extracts on the internet (King Arthur sells some good ones). Mrs. Kitchen Riffs has tried substituting various liqueurs and spirits (such as rum) for the extracts. Alas, they don’t work well because they’re not as strongly flavored. You have to use so much that it makes the consistency of the filling too soft (liquid). To thin the melted chocolate, Mrs K R suggests using a low-flavor “neutral” vegetable oil (such as canola). Or you could try vegetable shortening. “So what do you think?” asked Mrs. Kitchen Riffs as she offered samples from her first batch of buttercream candies. “What gave you the idea?” I asked, reaching for another piece. “And so you can taste test?” Mrs K R inquired sweetly. “Well, that too,” I admitted. So the Easter Bunny arrived early at Kitchen Riffs central this year. And he didn’t have to lug any boxes this time. Hi Ray, these are so much fun! And the flavor is terrific - much more intense than any but the better (and expensive) chocolates. Thanks for the comment. Hi Alyssa, lucky you! They're really good, aren't they? ;-) Thanks for the comment. I've never seen such a colourful bascket! I had a candy store years back and these would have sold like hot cakes. I used to have a candy maker that made all the butter creams for me...they are so much better than commercially produced chocolates. Great job! Hi La Torontoise, these really a fun to make, even more fun to eat! Making up the basket was also a lot of fun. ;-) Thanks for the comment. Hi Karen, the fresh ones are so wonderful. These are also flavorful enough that you end up not eating as many - just one is awfully satisfying, two if you're particularly hungry or greedy (two will fill you up, though). It must have been fun to have had a candy store! Thanks for the comment. That's a great idea to make your own and good advice about the vanilla essence. I'm not sure what I am going to do about Easter - no Easter eggs will be very sad. Hi Uru, this is definitely a recipe for you! Thanks for the comment. Hi Suzanne, no Easter eggs would indeed be very sad. Hope you figure out something. Thanks for the comment. Yum, we use to make these when we were kids, both my sister and I have a soft sport for peppermint filled chocolate. Much better than the store bought variety for sure, thanks for bringing back the memories. These are fun, aren't they? We haven't done the peppermint variety yet, but I'm sure we'll get to it! Thanks for the comment. Well, we don't celebrate Easter but that's OK. I still love Easter eggs. And these look like a lot to love! These look amazing -- and far, far better than most mass-manufactured store-bought ones that have so many preservatives in them. This is a nice kids treat this coming Easter. 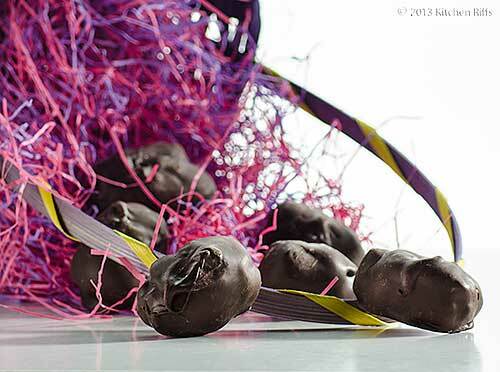 Nothing can be better than home-made chocolate, especially for Easter. Love the creamy filling inside. The best part is that it is not that difficult to make. I am definitely going to try Mrs. K R's recipe for this Easter. Sounds so sweet! Please, deliver my thanks to your wife! I was sold when you mentioned no preservatives. What a great idea. I have to make these for my nephew. He'll love them! Hi Abbe, no need to celebrate Easter to enjoy Easter eggs! And these are indeed wonderful. ;-) Thanks for your comment. Hi Carolyn, these are really great! And the flavor is so good, you'll eat fewer. That's either a good or bad thing. ;-) Thanks for the comment. Hi Raymund, nice for kids and adults alike! Thanks for the comment. Hi Holly, I'll indeed convey your thanks! You'll like these - they're quite easy, as you noted, plus the flavor really is great. Enjoy! And thanks for the comment. Hi Kristi, these really are wonderful, and I know your nephew will love them. And I'm sure you'll have a taste, too. ;-) Thanks for the comment. Hi Marina, these really are great! And coconut-filled eggs seem to be pretty popular at Easter. I love coconut (and lemon) so I'll have one any time! Thanks for the comment. 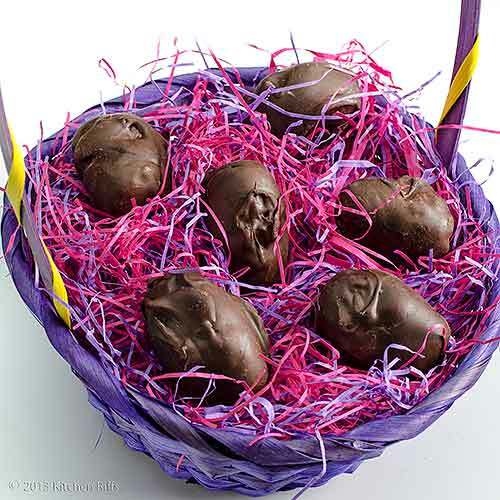 I love the idea of making your own Easter candy. Great idea!! Hi Kiran, you need these! You'll love them. ;-) Thanks for the comment. I love the idea of making chocolate easter eggs at home! The preservatives in the store-bought ones do give me pause. I will have to try making them at home this year. Thank you and your wife for the great recipe! Wonderful post, John. It reminds me of Mom. Once she and Dad retired, she started making candies for Easter. Homemade buttercream candies are nothing like store-bought. I think more would make them if they only knew. Thanks for showing us how to make them -- and for the memories. Wow, the Easter eggs do look delish! Homemade Easter treats convey such a sweet message. I would love to try these!! And the coconut filling is going to rock! Last night, my daughter admitted she's never met a frosting that she didn't like! These homemade Easter eggs look fantastic! I may have to get brave and try these! Well done! Coconut filled easter eggs ? Sounds amazing ! I have a good friend who would love these, she's a butter cream frosting kinda gal, always scrapes the frosting off my cake. Great idea to make these at home instead of buying them! Hi Dawn, it's really a lot of fun! I think you'd enjoy it. Thanks for the comment. Hi Gomo, these do take a bit of time, but almost all of it is waiting for the filling to chill. The flavor is so much better than store bought - it'll be hard to go back. Thanks for the comment. Hi Anne, the raspberry are excellent - even though the recipe is for vanilla (because it's the basic one), the candies in the photo were actually raspberry. Really, we've found that any flavor we fancy is pretty good. Thanks for the comment. Hi John, food is so much about memories, I'm always happy to oblige in that area! Thanks for the comment. Hi Purabi, they really are delish! The coconut filling is excellent - one of my favorites. Mrs K R is going to be making another batch with coconut for Easter. Thanks for the comment. Hi Liz, I'll bet your daughter would love these! Their flavor rocks. Thanks for the comment. Hi Sketched Chef, they are amazing, they are! Thanks for the comment. Hi Gourmantine, around here, a day is really pushing it! At least the first time Mrs K R made them - in subsequent batches - and she made quite a few, to perfect her recipe - we did show more restraint. ;-) Thanks for the comment. Hi Judy, your friend would love these! They're really wonderful. Thanks for the comment. Oh my! Candy, Candy, Candy! I am more inspired than ever to give candy making a go (still have your fudge recipes bookmarked--but so afraid of the consequences, i.e., my lack of restraint in consuming it ALL!). Thanks for a wonderful share! Hi Kelly, candy is good! I do know what you mean about the consequences - we give away an awful lot of what we make so we don't have it around tempting us! Thanks for the comment. These look AWESOME! Thanks for sharing this wonderful recipe - I'm already thinking of who I'd like to make them for. Hi Beth - you'll love these! They're wonderful. ;-) Thanks for the comment. I agree with you...I'm not visiting the candy session this Easter either! :) It's always better to make our own candy with ingredients that we can pronounce. Plus, you can make them into whatever you like. I love your idea of Candy East Eggs. Very festive for Easter. So easy to make, and so many possible variations! Perfection. I am sure these are so much better than what you can buy in the store! Hi Amy, that commercial stuff is good and all, but too pricey for what you get. And I really don't want to pay for those chemicals. Thanks for the comment. Hi Julia, one of the great things about these really are the variety - if you can imagine it, you can probably make it. And they're far better than most of what you buy in the store (hard to beat the really expensive candies, though). Thanks for the comment. I am so making these. And you don't have to sell me on good vanilla! I adore vanilla - good vanilla (supposedly that makes me namby-pamby). And I have enough time to do several flavors. So the liquers - not so good? Like a Kahlua or Amaretto? Now I just have to figure out how to keep the kitten out of the melted chocolate. I'd love to make them but it's too dangerous, I'd eat them all! Hi Barbara, Mrs K R and I do enjoy life. ;-) These are really swell - I think you'd like them. Thanks for the comment. Hi Claudia, you'll really like these! Although alas, Mrs K R tried, but couldn't figure out a way to make things like Kahlua or Amaretto work - their flavors aren't as intense as the extracts, so you need too much of the liqueurs to get the right flavor, and then the buttercream becomes a bit mushy. And good luck with keeping your cat out of the chocolate. Your cat really is a character. ;-) Thanks for the comment. I love homemade chocolates and these are a real treat. Well done to the Mrs! Hi Marta, that's a real danger - these things are so tasty! Fortunately they have enough flavor that you're quickly satisfied, but they are enticing. Thanks for the comment. Hi Maureen, these are wonderful! Mrs K R is definitely a keeper. ;-) Thanks for the comment. Hi Bam, oh, I left a couple for Mrs K R. ;-) These are fun to make, and there are some great rum extracts out there - perfect for this. I have a feeling the Easter Bunny is going to be very good to us this year! Thanks for the comment. What a neat Easter recipe! I like making my own treats rather than buying all those cadbury eggs out there. They turned out excellent, good job! Hi Natalie, this recipe is loads of fun. And the candies are so tasty - really worth making. Thanks for the comment. Hi MJ, of course I was going to show the inside - that's the best part! These are wonderful, and really are pretty easy to make. Easy for me to say, of course! ;-) Thanks for the comment. Wonderful eggs! I'm pretty sure they are incredibly addictive. Hi Rosa, they are addictive - too addictive! But it's worth it. ;-) Thanks for the comment. John these are wonderful. Of course the problem would be if I made them for children they may not get the chance to even see them - I'd gobble them up quickly. I love anything chocolate! This will be such a fun treat to make. Thanks for sharing the recipe with us. Hi Vicki, aren't they great? I know what you mean about not sharing these - the cook gets first dibs! Thanks for the comment. I don't like imitation vanilla, too. If I can't get pure vanilla I usually make my own vanilla sugar, which comes in handy. Great post. Hi Frank, these candies are actually so rich that after a couple you're pretty full. Usually. ;-) We should probably make vanilla sugar sometime - it's really useful stuff to have around. Thanks for the comment. They look fantastic! I love the cute little basket they're in, too! Thanks for sharing this wonderful recipe, bookmark! Hope to try this soon. oh what a wonderful wonderful idea...looks so yummy! i am thinking shall add a few drops of beet juice to get that pretty pink...my girls would love them!! Hi Ali, they are really great! Well worth having - basket or no. ;-) Thanks for the comment. Hi Amelia, actually never noticed that desserts spelled backwards is stressed! No stress to get you a dozen. ;-) Don't worry - I'll dedicate more than several to you! Thanks for the comment. Hi Shobha, red beet juice is a terrific idea! Maraschino cherry juice works too, although you need to use so much it makes the filling a little too liquid IMO. Thanks for the comment. If I had the same kind of wonderful taste-test kitchen policy in my place, I'd be buying new jeans! (Not that I don't have enough trouble with that already on my own.) These sound so much better than the store-bought stuff--excited to try it! Hi Ala, we do taste test, but only in moderation. That's my story, and I'm sticking to it! ;-) These really are great - something I know you'd enjoy. Thanks for the comment. Oh this looks amazing! I would have a hard time just eating one. What a fun way to celebrate with easter candy...and not buy the overly processed kind at the store! Hi Monet, eating one really is hard! Although after the first round of 2 (or 3!) it actually becomes easier - these are pretty rich, and they're pretty filling. Thanks for the comment. What a perfect treat for easter! I always buy them, but maybe this year I will make them! Thank you for this post! Hi Cathleen, we always bought them too, but that's now a thing of the past for us! Thanks for the comment. Hi Lydia, aren't these a fun candy? And overall really pretty easy. Glad you enjoyed them! Thanks for taking time to comment. Hi Terra, these are really good! I'll bet your mom will like this - and if you're lucky, she'll share some with you! Thanks for the kind words, and comment. I sometimes get scared what's in those candies that we can get from stores. They are pretty inexpensive and mass produced and most people eat without knowing what's in it. I like the homemade version and I would make it if it's easy and delicious! This sounds like a great recipe. This year we will be traveling but I definitely want to make Easter egg candies one day! Lol, this post made me ridiculously happy. I love these treats and excellent that they're homemade. Was the buttercream really sweet? That's usually my issue with buttercream and frosting in general and I'd love to give this a shot but may cut down on the powdered sugar by half a cup or so. Hi Nami, these really are worth making sometime when you're at home. They do need to be refrigerated, though, not only because they don't have preservative (although I'm sure they'd be fine for a few days) but because the chocolate gets a little soft after they've been out of the refrigerator for a half hour or so. Thanks for the comment. Hi Food Jaunts, you can easily cut down on the sugar, and if you're worried about these being too sweet, I'd definitely cut down a bit when you first make them. Yes, they were sweet - but not over-the-top. But I'm sure you'll be able to adjust the sugar to your taste. Thanks for the comment. Okay this is just convincing me I need to move closer to you two immediately. These are incredible. Hi Kim, you do need to move closer! ;-) You'd really like these, and they're quite easy to make. Too easy! Thanks for the comment.